I love the smell of these flowers. Even more, I love that it's Halloween and I still have flowers & it's warm enough to trick or treat without wearing a heavy coat. It was warm and kind of humid here for the Trick or Treaters. Much cooler this morning. What flower is that in your photo? ok, I will go with that. thanks! 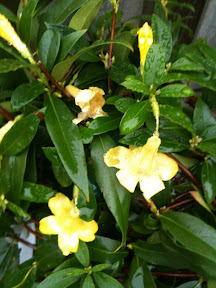 It was labeled as the regular Carolina Jessamine, but scgardener is on to something, because my other vines of this don't bloom in the fall. Who wants bugs in their garden?